AT LAST! Discover How to Raise Healthy, Fertile Quail, Produce THOUSANDS of Eggs & Generate an Additional Income FAST - And All from Your Own Backyard. Raising Quail is becoming more and more popular all over the world, due to it's speed, ease, convenience and low space requirements. 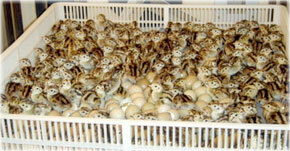 Quails are now classed as a delicacy in the US, and demand high prices from the restaurant trade as a result. What's more, quail eggs are considered to be a 'super food' by nutritionists and doctors alike. Are you interested in raising quail, but are in need of expert advice on how to get started? Are you a seasoned quail breeder looking to take your breeding to the next level, while freeing up more of your time? Are you confused about what type of incubator or brooder to use, how to set up your pens, or what to feed your birds to get the best results? Would you like to discover a proven, step-by-step system for raising quail the right way, from a seasoned expert with over 15 years of experience? If you answered yes to any of those questions, then you're in exactly the right place! How to create a real, sustainable and environmentally-friendly home based business selling live quails, their eggs and their meat. 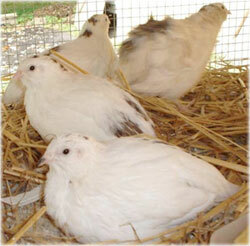 Plus much more information from a quail breeder with over 15 years of experience! Raising your own quail is incredibly easy, quick, and surprisingly cheap - and you can be enjoying (or selling) your own delicious, organic and gourmet quality quail (or their eggs) in as little as 6 weeks from now. In fact, quail will put clean, fresh and high-quality protein on your table faster than any other type of livestock (more on this in a moment). But that's not to say that you can ONLY raise quail for their eggs and meat. You can keep them as pets too - and more and more people are doing exactly that. Quails are tame, beautiful birds, much quieter than chickens (so they won't annoy your neighbours!) and there are over 130 species to choose from. But whatever your reason for raising quail, without the right advice and guidance; it's incredibly easy to get things SPECTACULARLY WRONG, which will cost you heaps of time, effort and money. And let's face it, why go through months or years of trial and error, and dozens of mistakes, when YOU DON'T HAVE TO? 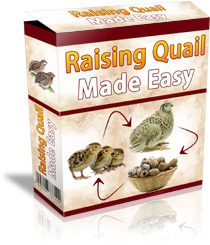 Today, I'm going to show you how to breed and raise quail quickly and easily. And I'll even show you how to start a profitable home based business too - something I've done myself and now generate a 5-figure monthly income from. Hello, my name is Joe and I started raising quail by accident - all the way back in 2002. Back then I was working at an Elementary school, teaching a class of first graders, and I loved it. At the start of every year, I would ask the kids to come up with ideas for new class projects. I would hand out a piece of paper, and the children would write down what they wanted to do. That year, one of the ideas sparked my interest. Something like this would teach the children about nature, and how to care for other living creatures, and I could easily involve them in the whole process. That evening I visited the local library and took out a book on raising quail to find out what we needed to do. After further research, the path was clear. I had to buy an incubator and fertile quail eggs to get started - nothing fancy or expensive. The following morning I went to the headmaster for approval of the project. He loved the idea too, and agreed immediately. I still remember the looks on the children's faces when they came in class to find everything in place. That morning, we placed the eggs and started up the incubator. We constantly monitored the temperature, humidity, and ventilation levels, and turned the eggs as instructed in the incubator's manual. On the 17th day of incubation, the eggs started to hatch. Despite following the instructions to the letter, only 9 eggs out of a total of 48 hatched. Something went wrong - but I didn't know what. Maybe the eggs I'd bought weren't fertile? Maybe the incubator hadn't worked properly? I didn't know what went wrong for so many eggs not to hatch, but at least the children still had 9 little quails to raise. Determined to keep every hatchling safe, I took the 9 little quails and all of the equipment home with me, and kept a close eye on them. I felt awful, and when I explained what had happened to the children, they were heartbroken. There was no way I was going to stop the project on such a sad note, and leave all of those kids so disappointed. So the next day, I bought a new batch of eggs from another seller. This time, only 6 eggs hatched, and again, none of them survived beyond the first day. After this happened, a few of the parents called the school to complain that their children were becoming upset at the deaths of all these poor little chicks. They wanted me to stop the project immediately. I understood completely, and agreed to leave it there, but in my own mind, that wasn't the end of it. I didn't want the children's memories of this project to be nothing but DEATH. So I started looking into quail raising in a big way. I bought books, did a lot of online research, and spoke to a number of local quail farmers for advice. But my third attempt, which I set up at home, produced equally poor results. I was about to give up on the whole idea altogether, when one night, while browsing a forum online, I got the breakthrough I needed. The article was written by the most famous and renowned Quail breeding expert in the world - Dr Fred Thornberry - who back in the 1990s had selectively bred a brand-new type of quail, the Texas A & M, the fastest growing quail there is. As an Extension Specialist in the Department of Poultry Science at Texas A & M University, Dr Thornberry had been tasked with cross-breeding quails in the pursuit of a sturdier, fast growing bird. But more importantly, he was able to produce a bird that would mature in just 6 weeks, enabling breeders to produce eggs and meat much faster. Additionally, I discovered something even more amazing. During his research, he'd not only bred the ultimate, and fastest maturing quail. If I wanted to discover how to raise quail properly - I needed to find out more about Dr Thornberry's system at the Texas A & M University. So I phoned the University, and asked to speak to Dr Thornberry. Unfortunately I was told that the quail breeding program, albeit hugely successful, had been discontinued because it had achieved its goals. But it wasn't all bad news. Before hanging up, I was told that Dr Thornberry's techniques were still widely being used in the industry, particularly by a commercial quail farm in Ohio, run by a former student of his. So I made the three hour trip to Ohio where I met a couple called Bob and Lauren, two quail breeders who were earning tens of thousands of dollars a month breeding quail. I toured their facility, learned exactly how they operate, and finally figured out exactly what I'd been doing wrong. I loved how quick and simple the whole process was when it was done right. I loved the idea of breeding my own birds, and watching them hatch and thrive. And I loved the thought of being able to produce healthy, organic, gourmet-quality eggs and meat for my family to enjoy. When I was back home, I bought a new batch of eggs from the same quail breeder as before, and followed the new system which I'd just learned. This time, 45 of the 50 eggs hatched, and all of them survived. Six months later, and they were producing two dozen eggs a day - and they were absolutely delicious! My wife loved them, my kids loved them, and when I told the school children all about it, they were desperate to see my quail. As more and more of the children's parents began to hear about my new hobby, I was bombarded with requests. Parents started knocking on my door, asking if I could sell them some quail or eggs. Afterwards, local restaurants started calling me up to place bulk orders. I quit my teaching job and dedicated my time to raising quail. It was the best decision I've ever made in my life! That was 15 years ago - and I love it just as much now as I did back then. It's a good question - and one I'd like to answer right now. In all the years I've been raising quail, I've sold thousands of fertile eggs to prospective quail breeders and spoke with literally hundreds of people asking for advice on everything to do with raising quail. I've received emails from all over the World, and I've always helped these people as much as I could. But of course, I've never been able to dedicate enough time to providing them with a fully comprehensive, step-by-step guide for raising quail the right way. I've decided to put everything I've learned about raising quail into an step-by-step system that anyone can follow. And today, I want to share my secrets with YOU. 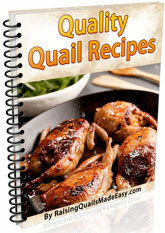 A proven, step-by-step system for raising healthy quail in your own backyard! Where to obtain highly - fertile eggs - Once you've selected your quail breed, the next step is to get some eggs. Here I'll show you exactly where to obtain fertile eggs to get started with. The type of equipment you need - From incubators to brooders and pens, I reveal the best equipment in the business, and which incubators and brooders to get based on your budget and the amount of quail you plan to raise. How to construct a quail brooder and pens - In this section, you will be given all the advice, tips and tricks you need to build your very own quail pens, pairing cages and brooders. How to incubate your eggs - So many people get this wrong, which results in low hatch rates and time and money wasted. Here you will discover the right way to handle your eggs to avoid contamination, the correct egg turning technique, the ideal temperature and humidity levels for your incubator to maximize your hatch rates, and much more. How to keep your chicks alive - Once your eggs have hatched, the next step is the 'brooding' phrase. Get this wrong and many of your quail chicks will be lost in their first few hours. In this section I reveal how to set up the ideal brooding environment cheaply, as well as the most common mistakes that will wipe out your newly hatched quail. What to feed your Quail - In my quail feeding section you will discover the correct types of feed to use for quail chicks, breeders (in and off season), meat birds, egg layers, as well as quail for release. How to feed your Quail - Knowing when and what type of feeding and drinking devices to use is a hugely important. Select an incorrect watering tray, for example, and your quail chicks could get wet and die from the cold, or even drown. Here I'll show you how to use an automated process for drinking and feeding which will save you heaps of time and effort, while keeping your quails happy! When to move your chicks to grow out pens - This can vary depending on the quail chicks you're raising. Do it too soon or too late and your chicks might not survive. In this section I reveal the ideal time to go from brooding to grow out pens for each breed of quail. How to take care of your eggs - After all that work raising your quail (keeping them alive until maturity and watching them lay their first eggs), the next step is to take care of those eggs correctly to ensure the highest hatch rates. In this section you will be shown how to properly handle your eggs, how to collect them and where to store them to ensure that they remain viable and fresh for as long as possible. How to prepare your quail meat for eating - If you're raising quail for their meat, here you will discover how best to cook and prepare the meat for your family table, or for a paying customer. PLUS! You will also be shown how to raise quails for release (to restock wild quail populations) and how to raise quails for the pet market. 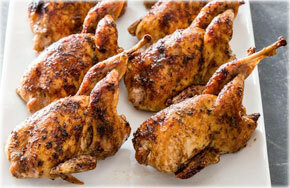 Quail provide the complete micro-farming experience. Firstly, quails are less than one third the size of chickens, so they don't take up much space, making them the perfect addition to urban backyards and rural barnyards. Getting started is extremely cheap, with little more than an incubator and some eggs required. Quail can be housed in just a small pen or cage, out of sight of other people. They are also extremely quiet, meaning (unlike chickens) they won't annoy your neighbours! 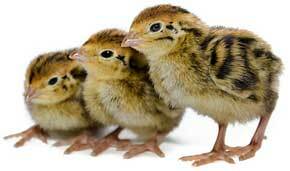 Quails are hardy birds, and don't get sick frequently. As long as they are raised properly and housed in the correct environment (following my step-by-step quail raising system) quails have very few health issues, and will live a healthy and productive life. As I mentioned previously, Quail will put fresh, high quality protein on your table faster than any other type of livestock. While chickens will start laying eggs between 24-28 weeks of age, quails mature (and start laying eggs) as early as 6 weeks after hatching. Another benefit of quail is their incredibly high rate of egg laying at between 300 and 350 eggs per year, compared to chickens, which is around 200 - 250. With quails being less than one third the size of chickens, it means you need less room and less feed to produce a greater number of eggs each month. Quail and their eggs are an increasingly popular restaurant dish, and are now treated as 'gourmet' foods, gracing the pages of magazines like Martha Stewart Living and Gourmet. 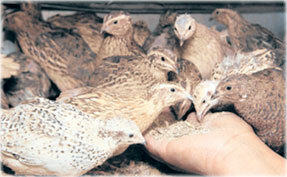 As demand grows, quail farmers are able to charge higher and higher prices. 6. ANYONE CAN DO IT! If you think quail farming takes heaps of experience and money, you're wrong! Tommy Burner, an 11 year old from Devon in the UK, started with one quail egg given to him by his aunt. He was hooked immediately, and was soon breeding prize-winning birds from the original clutch. Now 15, Tommy has built up a business breeding and raising quail and selling eggs to local shops and restaurants. FACT! The nutritional value of a quail egg is three to four times greater than a chicken egg. Quail eggs contain 13% proteins compared to 11% in chicken eggs. Quail eggs also contain almost three times as much vitamin B1 as chicken eggs, double the amount of Vitamin B2 and Vitamin A, and five times as much iron and potassium. Plus, unlike chicken eggs, quail eggs have not been known to cause allergies. Instead, because they're rich in ovomucoid proteins, they actually fight infections and inflammations which lead to allergies, psoriasis, eczema and asthma. Studies have shown that regular consumption of quail eggs improves memory and increases brain health, due to the eggs being rich in choline, a chemical essential for brain function, while the eggs have also been shown to strengthen and protect the immune and nervous systems, promoting greater health and vitality. Removing toxins and heavy metals from the blood. Reducing the risk of cancer, and inhibiting cancerous growths. Nourishing the prostate gland and improving sexual function in men. Enhancing memory and brain activity. Strengthening the immune and nervous systems. Slowing down the aging of organs. Alleviating symptoms of Alzheimer's disease. Improving skin tone and complexion. For these reasons, nutritionists and doctors now agree on the classification of quail eggs as a 'super food'. Before I answer that, just take a moment to consider how much better you'll feel in both mind and body when you and your family are eating your own fresh, organic and gourmet quality quail eggs and meat, as opposed to the meat and eggs produced from diseased, distressed and genetically mutated chickens. After all, the health of your family is priceless. Secondly, just think how much money this information will save you. Let's say that you decide go it alone - without my 15 years of experience and knowledge - and try to do this yourself. The chances are, you will make mistakes that could have easily been avoided. By not following my proven quail raising system, you will waste money on incubation and brooding equipment, pen materials, feed, and much more. But more importantly, many of your eggs will fail to hatch, and a lot of your newborn chicks will die. Let's say that just 10 of your female quail eggs don't hatch - a tiny number. It really doesn't sound like much, does it? Each of those quails would have laid at least 300 eggs in a year. That's a whopping 3,000 eggs you've lost. But not only that, if those 3,000 eggs were to be incubated and just 75% of them hatched and matured - it would mean that you've lost 2250 quails. So let's assume that you would have sold those quails; how much money have you squandered? Well, if we take a VERY conservative estimate and say that each quail would have sold for just $5, and we deduct $250 from the total for their feed, we end up with $11,000 of lost profit! If you're serious about raising quail as a hobby, or as a business, how much would you pay for a proven system that will effectively GUARANTEE the highest hatch and survival rates possible? $1,000 would be fair, right? After all, that's still a huge bargain, because as you've just seen you'll save many multiples of that in your FIRST YEAR ALONE if my system saves JUST 10 more of your female chicks! And if you're planning to raise quail for the long-term, you're looking at a saving of TENS OF THOUSANDS of dollars. For the next few days, I've decided to do something crazy. In fact, I'm not even going to ask you for half that. I think you'll agree that $37 is an absolute bargain considering everything you're getting access to, and how much time, effort and money this system will save you - and 'make you' if you decide to turn it into a business like I've done. But if that's not your thing, it doesn't matter. You can simply use the system to raise quail as a hobby, and enjoy this bird's sweet, great-tasting meat, and put as many nutrient-rich, gourmet quality eggs on your family's table as you want to. As a thank you for ordering Raising Quails Made Easy, I'm also going to give you these incredible bonuses, absolutely free! As you’ve seen, anyone can raise quail and build a business. I did it - and you can do it too. Today, my business generates 5 figures a month, selling eggs and meat to the restaurant trade and local customers. 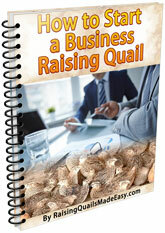 If you’d like to do the same, I’ve created a special bonus called How to Start a Business Raising Quail. In this comprehensive guide, I reveal my step-by-step formula that will have you profiting from quail in no time, including how to spot the right restaurants to approach, what to say (and what NOT to say) to prospective buyers to ensure the highest prices for your eggs and meat, how to correctly negotiate orders, and much more. This guide is valued at $47 on its own, yet you’re getting it absolutely free when you order. 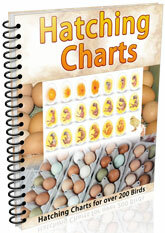 You will also receive my comprehensive hatching charts with over 200 species of birds - including all quail species. With these charts you will know the perfect temperature and humidity levels for each day of the incubation period as well as the exact time when to stop turning your eggs. This will ensuring optimum hatch rates and healthy hatchlings. These charts are the most accurate charts available anywhere. They are valued at $45 and you are getting them absolutely free! Whether you want to start raising quail as a hobby or as a business, you’ll love the taste of the eggs and meat you produce. In this special bonus, I’ve compiled some of the best and easy-to-prepare recipes for breakfast, lunch and dinner, so you and your family can whip up a great-tasting, healthy meal in minutes, and with the minimum of fuss! Once again, this recipe guide is valued at $37, but when you order today, it’s yours absolutely free. So when you order today, you're getting access to Raising Quails Made Easy, How to Start a Business Raising Quail, Hatching Charts and Quality Quail Recipes for the ridiculously low price of JUST $37! But hey, even though that's a tremendous bargain, I still understand that you might be a little unsure about investing even $37. After all, you don't know me at all. 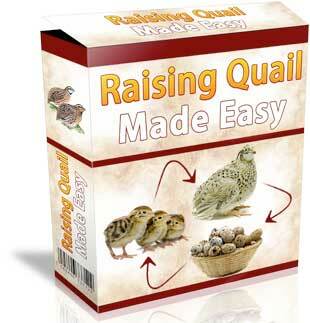 When you order today, you can put Raising Quails Made Easy to the test for a full 60 days, completely risk free. So right now, you don't need to say 'yes'. You just need to 'maybe'. You can then work your way through the entire program, follow my step-by-step quail raising process for two whole months, at zero financial risk to you. If you're not absolutely blown away by the results, or you simply change your mind for any reason at all, then all you need to do is send me an email (address provided with your order) within 60 days of your investment and I will refund every single cent, with no questions asked, and no hoops to jump through. OPTION #1: You can say 'no thanks', pass up this opportunity, and walk away completely. ... And instead, you'll have to carry on consuming eggs and meat produced by today's aggressively farmed, hormone-pumped and genetically manipulated chickens. Yum. OPTION #2: You can say 'no thanks' to this system, and go it alone. Sure, you can do that, but it will cost you - I guarantee it. You will make the same mistakes as every other quail raising beginner, and you will waste heaps of time, effort and money on months, or even years of trial and error - for the sake of saving $37. What's more, if you have any ambitions of raising quail as a business venture, ignoring this information will inevitably cost you hundreds, if not thousands of dollars in lost income, due to low hatch and survival rates, and incorrect equipment and materials. Does that make financial sense to you - or any kind of sense?! If someone said to you that you could swap $37 now for improved health, and hundreds or thousands of dollars in extra income, wouldn't you jump at the chance? And that leads us to the third option. The only option. OPTION #3: If you care about your family's health, would like to begin a fun and fulfilling hobby, or start a real, sustainable business quickly, easily and affordably, then this is your chance. And it can be yours in less than 15 seconds. And hey, if you're worried about the cost, remember that your order is fully protected by my iron-clad 60-day money-back guarantee, so you can't lose. PLEASE NOTE: This is a digital product. You will receive instant access the moment you order - even if it's 2am! P.S: This is the EXACT same step-by-step system that I use to run a 5-figure quail raising business from my own backyard. But remember, you don't have to do the "business" part. You can simply use this system to start raising quail as a fun and fulfilling hobby, and save yourself heaps of money and months (or even years) of time by avoiding the common mistakes that 99% of beginners make. P.P.S: Don't forget, this is a strictly limited time offer. I intend to raise the price to something approaching its real value very soon, and I honestly don't know when that will be. It could be next week, it could be tomorrow, or it could be in the next few seconds. So be sure to order now so you don't miss out on this huge saving. P.P.P.S: Being sceptical is natural and healthy, but I've made sure that there's absolutely no risk to you. When you order Raising Quails Made Easy today, you're fully protected by my rock-solid 60-day money-back guarantee. In short, if you're not 100% happy with the system, you won't pay a red cent. Order now and lock in your huge saving while you still can.